The Town of Victoria Park is expected to approve the mural at tonight’s council meeting after a recommendation from its Built Life Department manager Robert Cruickshank. Cr Rowena Skinner raised a concern at a meeting last week that the council’s approval of the mural could set a precedent. 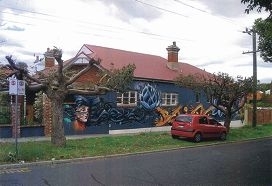 The mural was commissioned by the owners of a home whose wall is on the corner of Duncan Street and Sunbury Road, to discourage constant vandalism. Mr Cruickshank said although council did not generally support wall murals on homes, careful consideration had shown that approval would not set a precedent due to the specific circumstances of the case.